The FOMC says it will take its foot off the so-called economic brakes and the market cheers; better than expected earnings helped too. 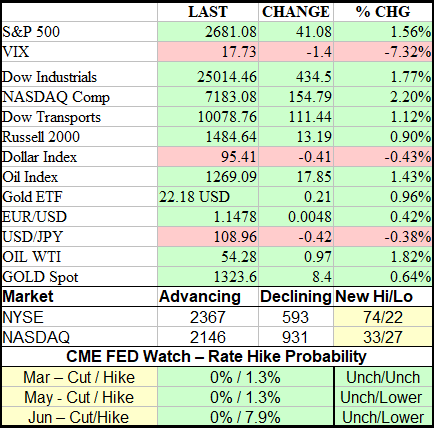 Market action was positive all morning but really kicked into high gear following the FOMC policy release. The release is everything the market could have asked for and helps brighten the outlook for this year. Notable changes in the statement include the removal of verbiage indicating further rate hikes this year. They took out the words 'further gradual increases' and replaced it with 'will be patient' about the timing and pace of future hikes. The Fed also made clear in a separate note that it would continue to operate with an ample balance sheet, a message to the effect the end of the balance sheet run-off is near. The new message, now official, is the committee is not on auto-pilot and will adjust as needed. Earnings were another big boost to today's markets. Yesterday's report from Apple shows that the worst of global economic slowdown is behind the company, an outlook taken as a proxy for the global economy. Apple's forecast for the coming year is below estimates made last year but it's far better than what the market was expecting and has sparked some optimism for the coming year. This morning a report from Boeing helped fan the flames of optimism. The aerospace giant reported record revenue and EPS, strong global demand, and a solid backlog of orders that guarantee a few more quarters of strong revenue and EPS at least. The backlog now sits at 5900 which equates to about six years of production at the current pace of delivery. The guidance for 2019 is above analysts expectations and helped send the stock up more than 6% in early pre-market trading. 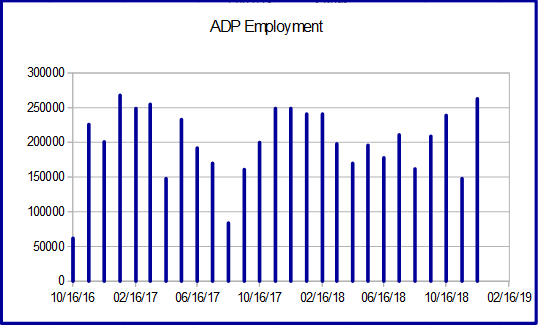 The ADP Employment Report came in much stronger than expected and points to continued labor market health in 2019. The headline213,000 is more than 30K above consensus estimates. It is offset by a downward revision to the previous month that leaves it as-expected but that is still a fair 180,000. The 12-month average is still above 200,000 as well. Job gains were fairly even across business size but skewed as always to the services side of things. On the goods-producing side of things construction and manufacturing both produced solid increases in hiring. If the NFP on Friday is anything like this I think we could see the equities market continue to recover. The GDP figures for the fourth quarter were delayed due to the government shutdown. The shutdown is over but its effects are still being felt. 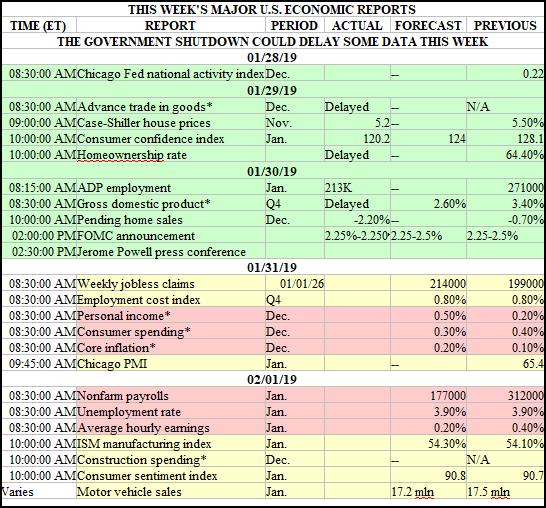 A lot of tomorrow's data including the Personal Income, Spending, and Consumer Inflation figures are likely to be delayed as well. Pending Home Sales fell -2.2% in the last month and are now at an 8 year low. The number of sales was affected by high rates and interest rate fears in late fall (when contracts are signed) so likely to rebound in the coming months. On a YOY basis, the number of Pending Sales fell -9.8% making this the twelfth straight month of YOY decline. Today's news from the FOMC is likely to help change this situation but home prices remain high so I don't expect a mad rush of buyers to materialize. The Dollar Index edged slightly higher in the early portion of the session but that was just the calm before the storm. 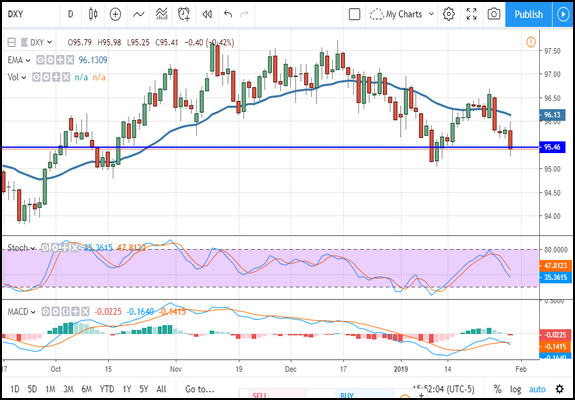 The index moved sharply lower following the FOMC policy release and broke below the $95.50 support target. The Fed's new stance, the change of policy statement, and the new outlook for the balance sheet have drastically altered policy expectation and put the dollar on a new path. The index is now headed lower and may hit $95 in the next few days. 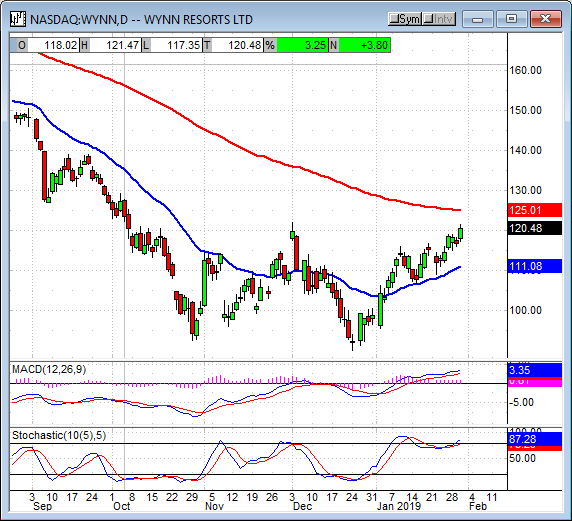 A move below $95 would be bearish and could take the index down to $94 or lower in the near to short-term. Gold prices extended their rally on the FOMC's dovish policy statement. The metal moved up another 0.90% in what looks like a strong move higher. Today's candle sets a new 8-month high and is supported by the indicators. Both indicators are bullish and on the rise, so higher prices are expected. Now that gold has surpassed the $1,320 level a move up to $1,340 and $1,360 looks much more likely. The Gold Miners are responding to favorably to rising gold prices. 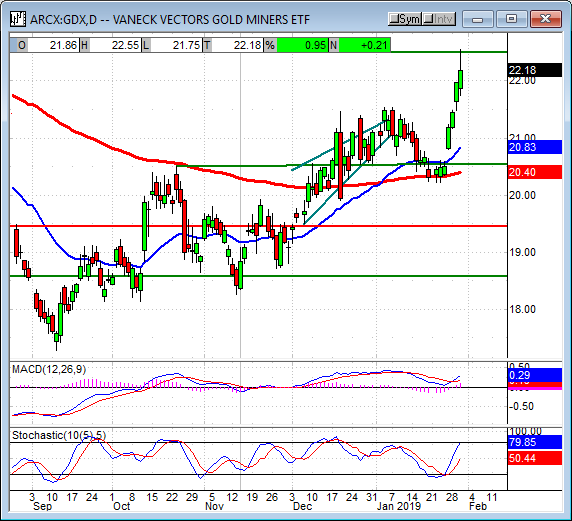 The Gold Miners ETF GDX rose 1.70% in today's action. 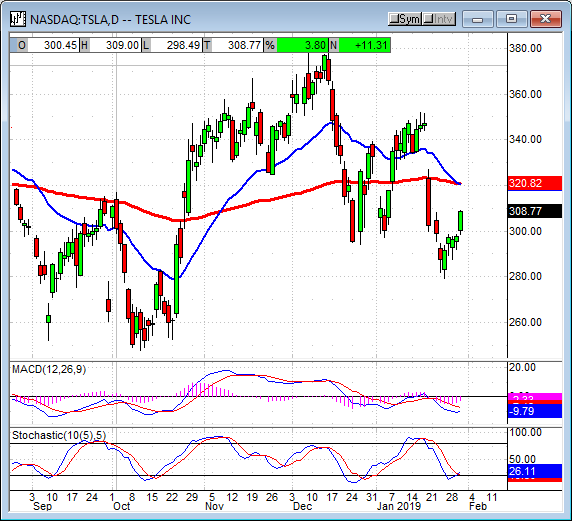 The ETF created a long green candle extending a move up from support to touch my resistance target at $22.50. This target is consistent with support levels from last year and may be strong. The indicators are bullish so I expect to see at least a test of resistance if not a break to new highs. The risk is gold prices if they fall the GDX will fall with them. The price of WTI jumped on today's inventory data but the gains did not hold. The EIA says crude stockpiles rose less than 1 million barrels when the market was expecting close to 3 million. On top of that storage of gasoline and distillates fell more than expected which raised concerns of tightening supply. Later in the day the reality US storage is at record highs helped trim gains. WTI settled near $54 after setting a multi-month high intraday. Today's gains were capped by resistance just above the $54 level which keeps oil trading within its congestion band. The Oil Index rose about 1.0% in today's session but it too remains range bound. 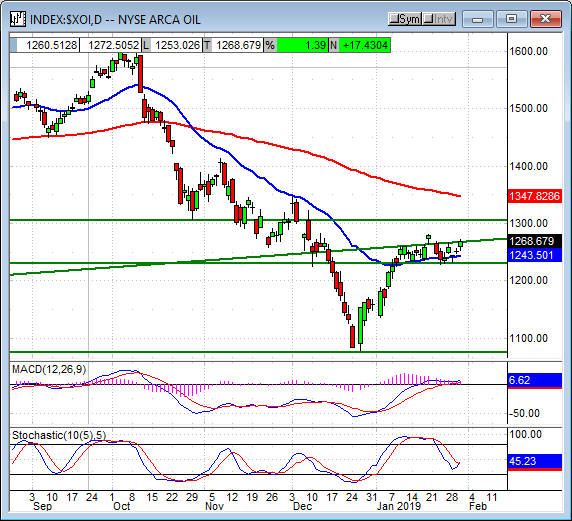 The index is consolidating above the short-term moving average and the 1,230 support line but remains beneath resistance near 1,275. 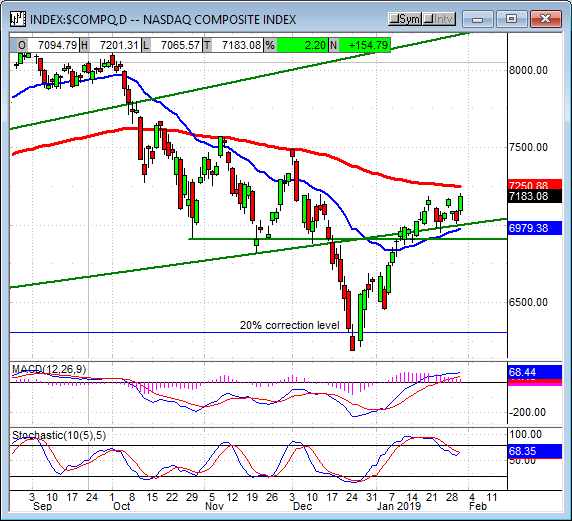 The indicators are mixed but suggest a weakening market and the possibility the index will retreat in the coming days. A move below 1,230 would be bearish and could take the index down to 1,100 in the near to short-term. 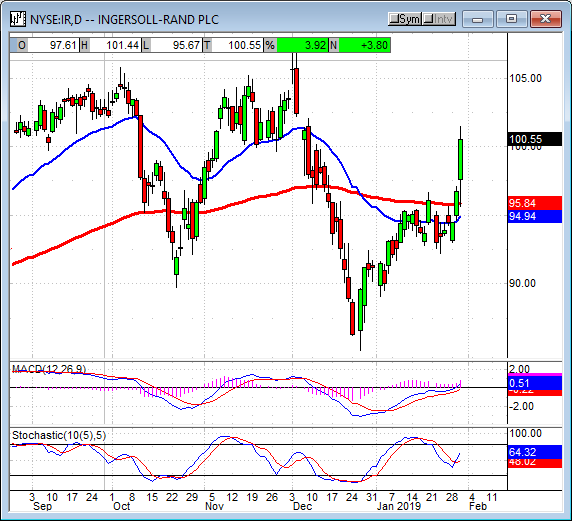 Industrial products maker Ingersol-Rand reported before the bell and sent shares soaring. The company was able to beat analysts estimates with its 29% increase in YOY adjusted EPS and give positive guidance. The company says growth will slow in 2019 but only a little to 5-6% from 2018's 8%. The company says bookings for new orders was robust with bookings up 17%, another indication 2019 activity (in the global economy) will not be as bad as people have been thinking. Facebook reported after the closing bell and delivered results comparable to Apple, far better than what recent events have led the market to believe was possible. The company says revenue grew more than 30% over the same quarter last year and beat consensus estimates for EPS by $0.20. Zuckerberg says the community and business continues to grow, we'll see about that. Shares of the stock jumped more than 6.5% on the news. Looks like FAANG is back. Microsoft grew revenue 12.4% over the same quarter last year but missed estimates by a narrow margin. The company says adjusted EPS is $1.10 which beat the consensus by a penny, GAAP EPS missed by a penny. Satya Nadella says strong growth in commercial cloud business is driving the business and getting stronger as the company works to deliver value to its customers. The commercial cloud business grew 48% over the last year and accounts for nearly a third of revenue so that is good news. Shares of the stock fell in after-hours trading though because growth just wasn't as strong as the market had hoped for. Tesla reported revenue growth topping 110% over the last year but it was not enough to drive the electric car market higher. Despite the growth, EPS fell far short of analysts expectations on the GAAP and non-GAAP comparison as efforts to control costs, ramp up production, and improve profitability fail to bear fruit. Shares of the stock were down about -2.5% on the news. Payment processor VISA reported solid 13.2% YOY revenue growth that beat analysts consensus. The company also beat expectations for EPS and sent shares moving higher in the after-hours session. 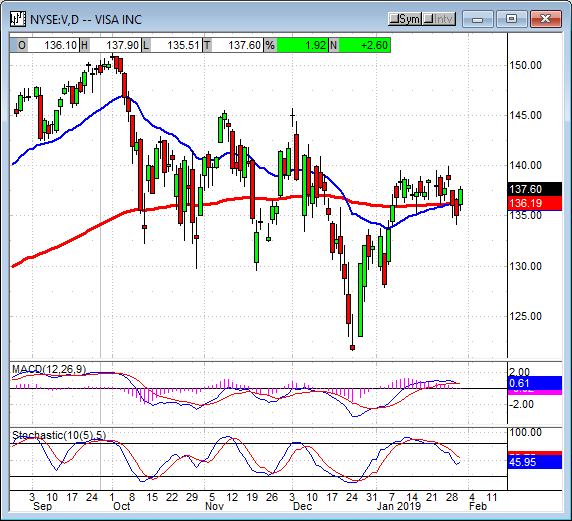 Considering the strength in labor markets, consumer banking, and holiday spending I would expect to see Visa continue to post solid results this year. Shares of Wynn were volatile in after-hours trading after delivering a mixed report. The company says revenue grew by 4.3% over last year and beat consensus estimates but EPS fell short of expectations. Shares first shot higher by 2.0% but then quickly gave up those gains and more as concerns for global growth sapped outlook. The indices moved higher today and look like they want to keep going higher. If the after-hours reports are any indication I think they will. 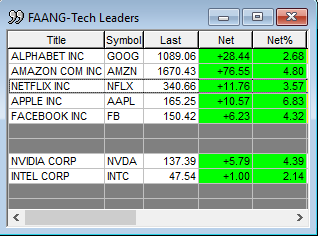 Today's leader was the NASDAQ Composite with a gain greater than 2.0%. The tech-heavy index created a medium sized candle that moved up to set a new high and extend the reversal that has been forming. The indicators are still mixed but rolling into bullish crossovers that are consistent with rising prices. 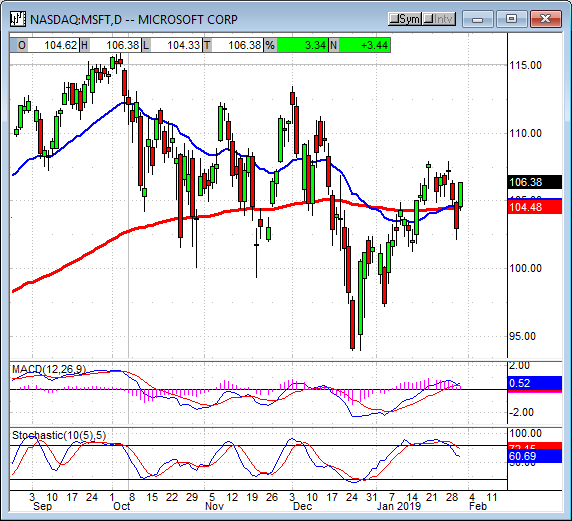 A move up may find resistance at the long-term moving average, a move above that would be bullish. The Dow Jones Industrial Average posted the second largest gain with an advance near 1.75%. The blue-chip index created a medium-sized green candle that shows some signs of resistance but is also poised to move higher. 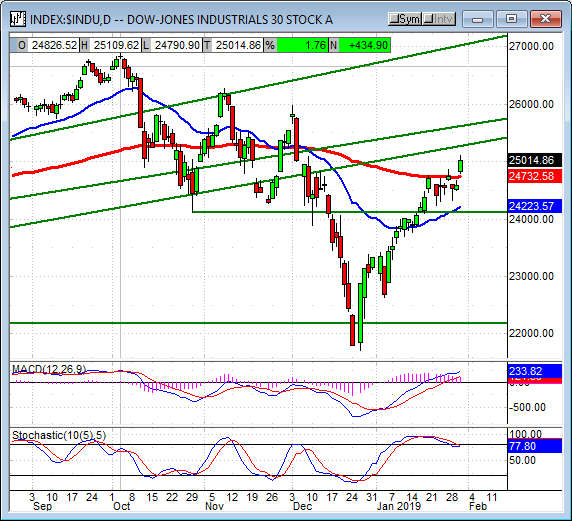 The indicators are still mixed but rolling into bullish trend-following signals that will confirm long-term uptrends. A move higher is expected but there is resistance at 25,250 that may hold prices from advancing further. A break above that level would be bullish. 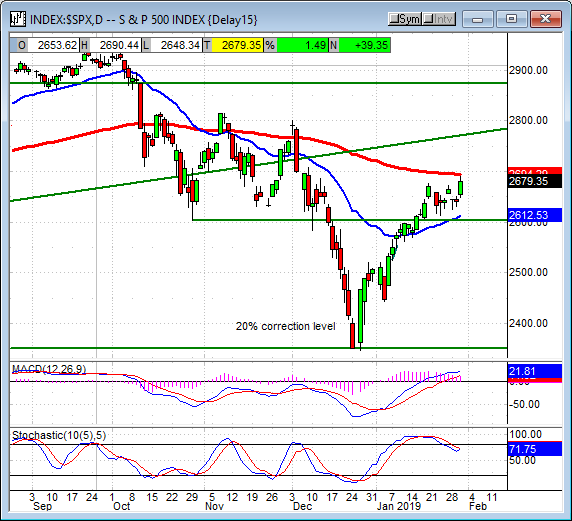 The S&P 500 advanced about 1.60% in a move that touched the long-term 150-day EMA. 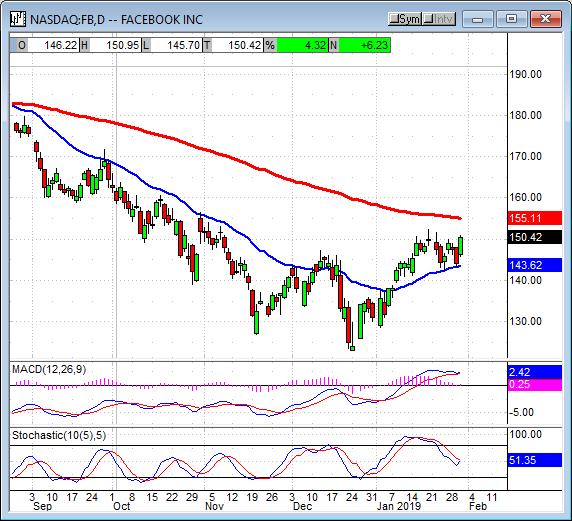 The EMA has provided some resistance but it isn't strong at this time, that may change. Until then the indicators are consistent with at least a test of resistance that may turn into a break of resistance should earnings continue to satisfy the market. A move above 2,700 would be bullish and could take the index up to 2,800 in the near to short-term. 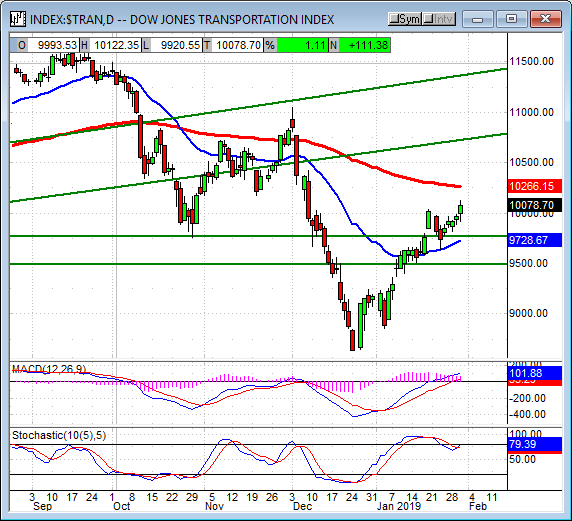 The Dow Jones Transportation Average moved up about 1.0% in today's session and looks like it could go higher. 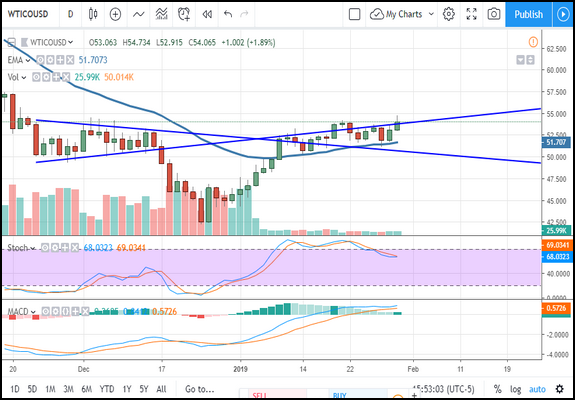 The index is moving up off of support and is confirmed by rising momentum so a move to the long-term moving average is likely. 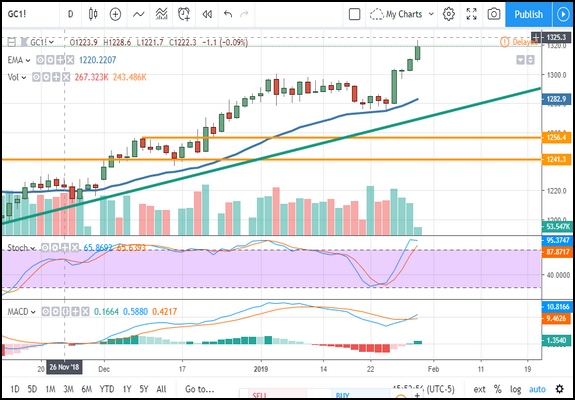 A move above the long-term EMA would be bullish and would likely result in a retest of 11,000 and 11,500 in the near to short-term. 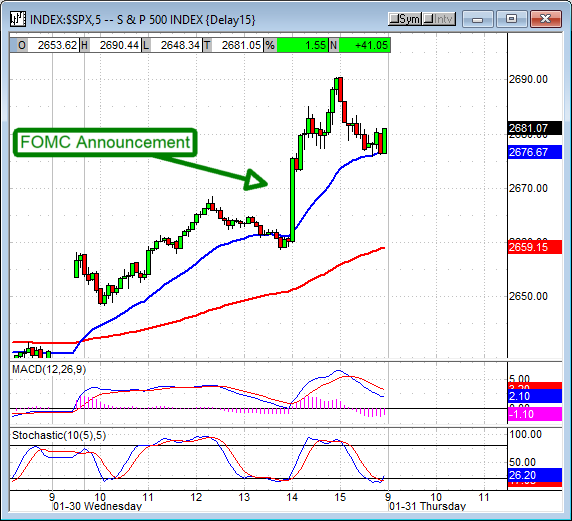 The Fed did it again, they sounded the all-clear for equities, at least so far as they are concerned. Now that the Fed worry can be moved to the back burner the market can focus on earnings and trade. The earnings are OK, not as bad as feared, and the impact of the trade war has so far been limited so yet another headwind may be mitigated. If trade relations deliver some positive news we may just see this market really begin to rally. I am firmly bullish for the long-term and still oh so very cautiously bullish for the near-term. Until then, remember the trend! PS, the baby is home alive and well. Joseph Edmund Hughes, named for his two grandfathers.